It's a perfectly good induction cooker hampered by a terrible app. It's been quite a drama for me in the kitchen lately: Due to a leak in my building, my cooking gas was shut off for 11 months. It's back now, but for most of last year I had to get by with takeout, microwaveables and oh-so-many salads. Tasty's OneTop seems tailor-made for these type of situations. It's an induction cooktop, which means it goes anywhere you can plug it in. And Tasty's step-by-step instructions make the whole cooking process manageable. It's the kind of thing you'd happily play with in a college dorm. Or, in my case, a small New York City apartment with no working stove. Every year I always have a few people over to watch the Oscars, so that seemed like a good opportunity to give the OneTop a spin. Home-cooked food and a new gadget to play with! Perfect pre-show entertainment! The big conceit of the OneTop over other electromagnetic induction burners is how it connects with the Tasty app over Bluetooth. Tasty specializes in those bird's-eye videos that walk you through each stage of a recipe quickly. They're fun to watch and generally give you a good idea of how hard a given dish might be to prepare. The app lets you watch the video at your own pace and follow along at home. The OneTop's advantage is that when connected to the app, it can automatically adjust its temperature according to what stage you're at in the recipe. It's supposed to be easier and more precise. The first step in this supposed ease of use was to download the Tasty app. I whipped out my Android device and went poking through Google Play, where there were several apps called Tasty but none that were the official one. It turns out that Tasty is iPhone-only right now. I ended up grabbing my iPad and installing it there. The lack of an Android app was annoying, but the decision to not have an actual iPad app is puzzling, given how many people use their tablets for cooking. That's definitely among the top five uses I have for my own iPad, as I appreciate having the larger screen to work with. In the app itself there's an icon at the bottom for the OneTop, which takes you to a screen filled with recipe categories and a giant blue button to connect. I tapped it, the OneTop chimed and it was done. I've struggled in the past to get devices to connect, so this was a relief. Things got a bit murkier as I poked through the app looking for a test recipe to cook. The number of OneTop "exclusive" recipes numbers 38, with an additional 26 from the Tasty archives that are "OneTop Friendly." That's ... not a lot. To be fair, it's comparable to what you get in a general-purpose cookbook, but it's still disappointing from a site that has hundreds of recipes at its disposal. 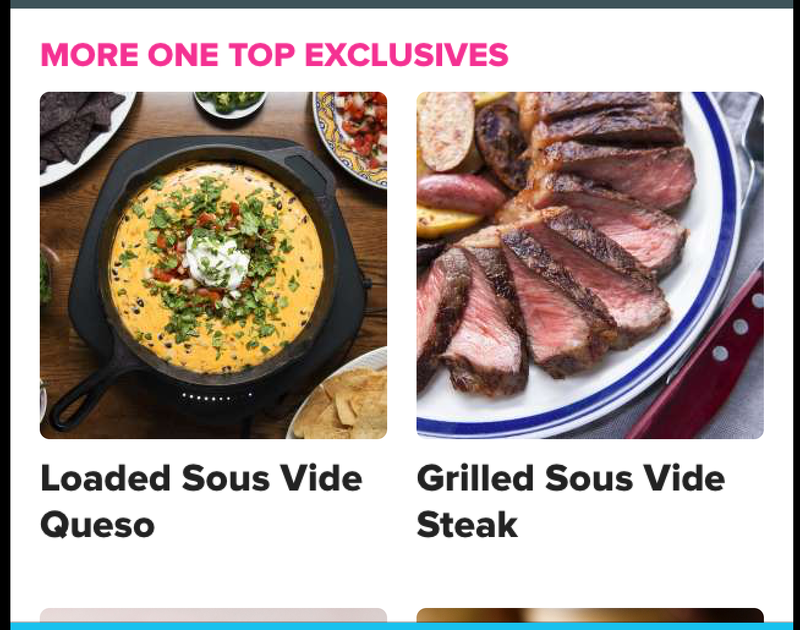 It's also not well organized -- there are a few major categories like "steak" and "eggs," but at least three rice dishes and four desserts were tossed into the "more" section of the app when they could have occupied their own sections. And you can't even search recipes! To find something to cook I had to browse through each dish manually, glancing over the required ingredients and equipment to gauge the difficulty level for myself. 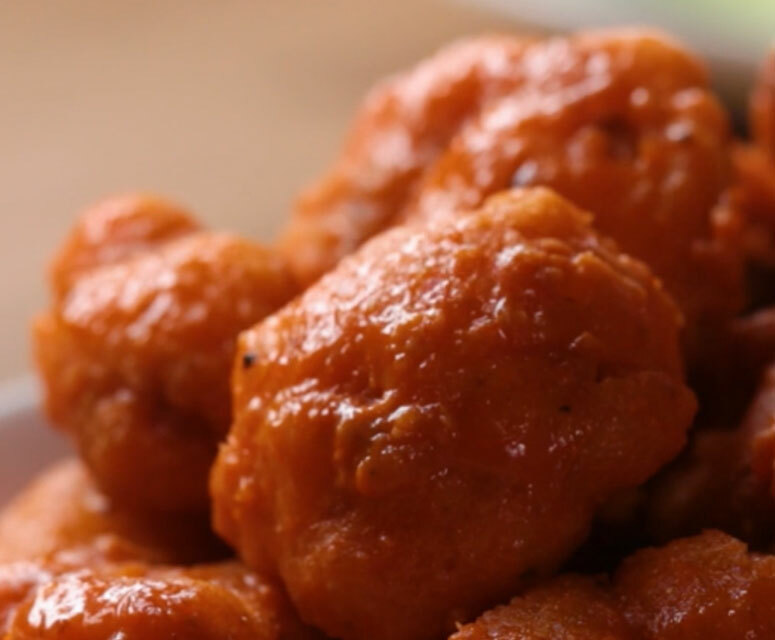 I eventually settled on a deep-fried buffalo-cauliflower recipe. Tasty sells a set of branded pots for the OneTop on its site. They're not required; any pot made out of magnetic material should do. However, I was sent a set with the OneTop review unit, so I gave them a spin. They're nice pots, sturdy with good heft. I put the stock pot on the OneTop and followed the instructions to fill it halfway with oil. I emptied the contents of a new, unopened bottle of vegetable oil into the pot and ... it wasn't enough. It stopped just shy of the temperature probe. I thought about switching pots, but the temperature probe was too long for any of the smaller ones I owned. I had to send one of my guests out to buy another bottle of oil just to fill the pot enough to reach the probe. Now, I could have figured out how much oil I needed with a bit of research -- it's an 8-quart stock pot, so I would have needed at least four quarts. That's far more than the 48-fluid-ounce bottles I tend to keep around my kitchen. But when the point of the OneTop is to make things easier, I shouldn't have to look this stuff up. It should be explicitly written down in the recipe. After that initial snafu, the next few steps were relatively simple. 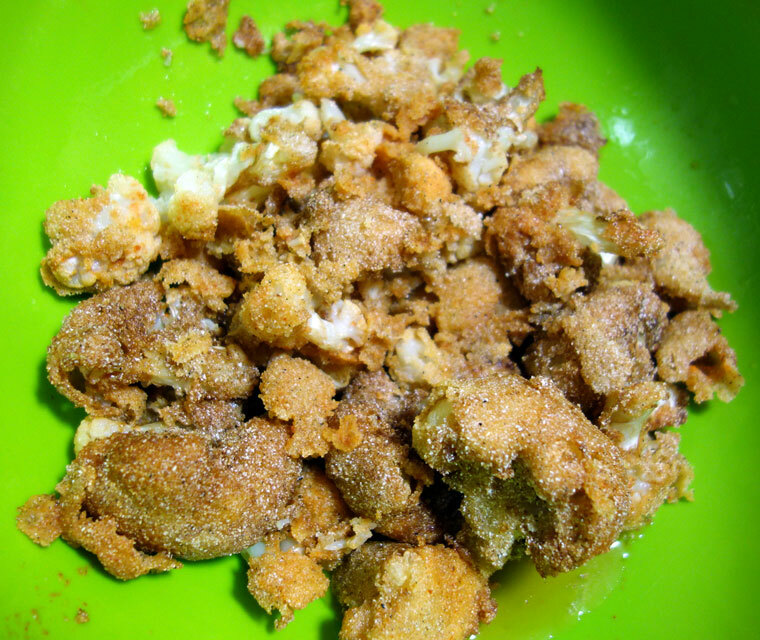 The OneTop began heating the oil, and I started battering the cauliflower in the cornmeal-hot sauce mixture. 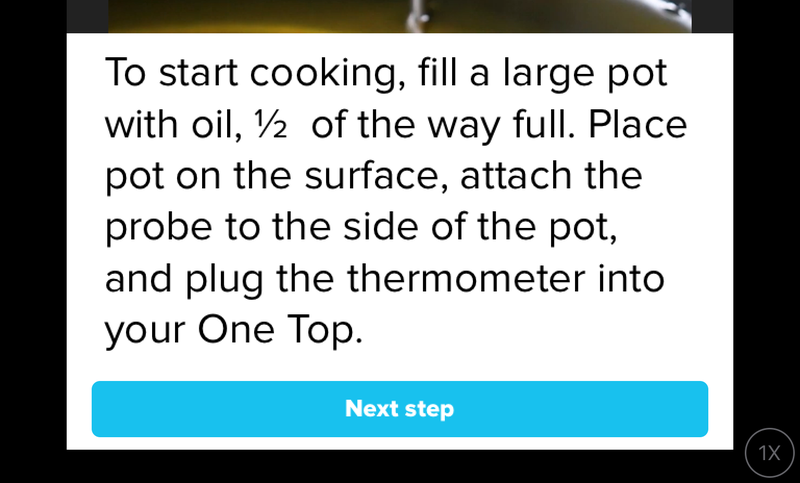 What's nice about the Tasty app here is that it displayed the current temperature of the oil, so I had a general idea of how much time it was until the next step. I wouldn't have been able to move on anyway -- the "next step" button won't appear until the OneTop is ready to go. It's a great idea for newbies who need to stay organized but frustrating if you want to peek ahead. The app doesn't let you go backward either. If you want to re-review a previous step or get an idea of what's coming next, there's a drop-down menu that lets you read the instructions, but you won't be able to watch the corresponding video. Once the oil was done, the "next step" button reappeared, and we were prompted to put the cauliflower in. So we brought the battered vegetables over to where we had set up the OneTop and carefully dropped them into the hot oil. It all seemed great until a few minutes later, when the app happily announced it was finished and turned off the cooker. This was not so: The cauliflower florets were still pale and soft, most definitely not the "golden brown and crispy" the recipe called for. It looks like the app started its timer the minute we advanced to the frying stage, not taking into account the time spent getting the cauliflower in. I tried to restart the timer but with no success -- eventually I turned it back on manually and asked my Google Home Mini to alert us instead. While we waited for the cauliflower to cook, I futzed with the app to try to get us back on track. The inability to go back meant I ended up restarting the entire recipe, and the timer still didn't seem to know what it was doing. At this point I gave up on using the step-by-step mode and just went to the straight text instructions to finish up the dish. We took the cauliflower nuggets out of the oil, let them dry a bit, tossed them in the sauce and then ate straight out of the mixing bowl. There was no point in plating it at this point; I was tired of the whole thing and didn't want to dirty more dishes. They were pretty tasty, at least. We had another cauliflower head, but at this point it just wasn't worth the hassle. I turned off the OneTop, dumped out $14 worth of dirty oil and then opened up Seamless to order vegetarian food. That too was tasty. It was also quicker, cheaper and didn't make me want to throw my iPad out the window. The OneTop promises to make cooking easy, but by taking away so much of my control, all it did was make it harder to fix problems when they arose. 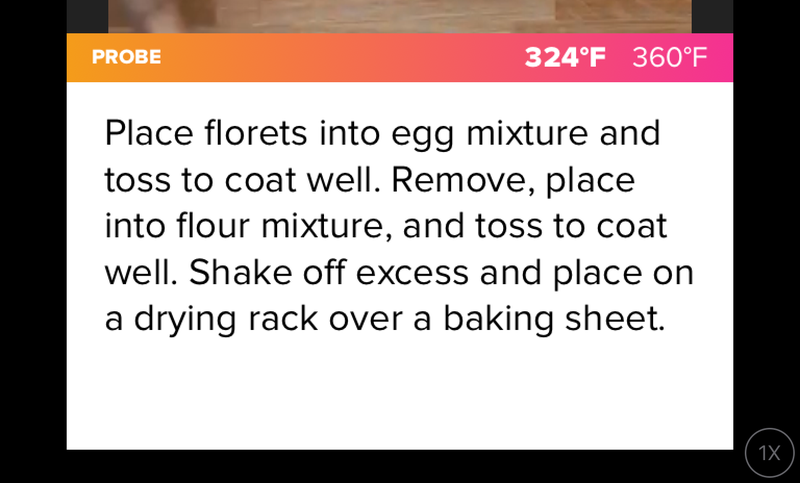 That's an essential skill to have in the kitchen, one you'll never learn if you lean on the Tasty app's half-baked experience.